COLOR(S):Usually white, but may come in red or brindle. 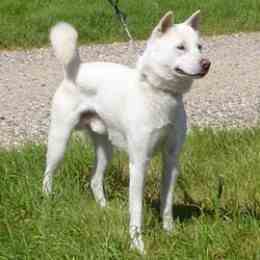 The Kishu Ken is a medium sized dog of almost always white color. They are a courageous, trustworthy breed with a close resemblance to the Shiba Inu and Ainu Dog. The Kishu, a medium sized sturdy dog, was once used for hunting deer and wild boar. They have the potential to be powerful, and have often been praised by the Japanese. Kishu Kens have a broad head with large prick ears, uncropped. They have a thick double coat that is very useful in the winter, soft underneath and harsh on the outside. They come in few colors, mostly white, but also in red, sesame or brindle. Kishu Kens are spirited, brave and strong. Due to their strong prey drive, they are not suited well around other, smaller pets. They do, however, do very well with other dogs, as they are pack hunters. They are clean, calm and quiet. They are gentle and devoted to family, but wary with strangers. Headstrong and a leader, the Kishu Ken is best suited for one person. Almost of the same lineage, they are closely related to the Kai Ken and Shikoku, all being named by the Japanese their "scarred glory". Kishu Kens are a more one-person dog. They are courageous and brave as hunters, and will be loyal to their owners. They have a strong prey drive, and will hunt small animals. They do well with other dogs, however, due to their pack instincts. They are quite headstrong and willful. They are devoted and loyal to family, getting along well with children. Kishu Kens like to keep an eye on whatever is going on, and sometimes find a high place to lookout from. They can be timid of strangers. They are easily housebroken, intelligent, and have a strong will. Training is necessary, as they are quite headstrong. Kishu Kens have a double coat. The undercoat is soft and dense, while the outer coat is short to medium length, harsh, and straight. Kishu Kens need regular exercise on a leash, taking walks or runs. They can also be given a job to do such as herding to satisfy their exercise. They should be brushed weekly to keep their fur mat free and clean. Bathe them as necessary, depending on how dirty they are. Their ears should be checked routinely for wax build up, infection or dirt. Their nails should also be trimmed regularly. Kishu Kens shed once or twice a year, making grooming at these times needed. There are none known. Due to isolation during the breed\'s development, the breed has kept pure and healthy. Kishu Kens should be trained from puppyhood, as they are very willful. They are more responsive than the Ainu or Kai Ken, however. They should be socialized from puppyhood, getting them used to new sights and sounds. Kishu Kens need adequate space to roam and exercise, meaning a house with a yard or urban environment with a fence. They will run away if given the chance, and should be fenced and leashed when outside of the fence or house. Kishu Kens actually do very well as housedogs. The best owner for this breed would be a dog-experienced individual living in a suburban or rural environment.